It’s been a flood of posts lately – I won’t apologize but it’s easy to be inspired by the reflective moments of December AND the availability of time after wrapping up teaching for the semester. I’ve done a lot of posts about my layouts for the month, but as I’ve seen more and more questions from new Bullet Journalists on the Bullet Journal Junkies Facebook group, I realized I have done a less-than-stellar job of talking through my actual process. I’ll try to do better for January’s! 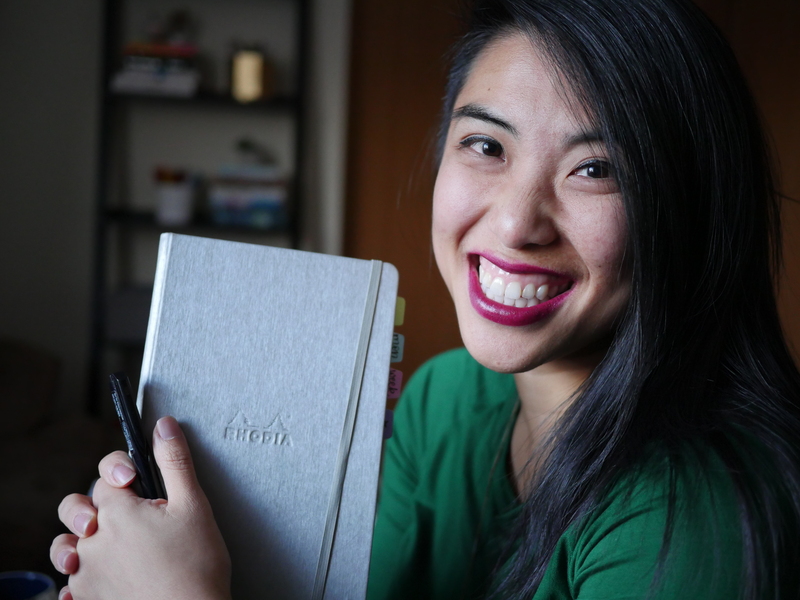 I have always loved having separation in one place but dislike ring-bound planners (read more on my planner journey here). This is a perfect compromise – this beautiful pink leather cover houses 4 notebook inserts so I can use the system but have similar things gathered together. I got this “FoxyDori” cover on sale through FoxyFix on their Etsy shop – these vibrant colors are really durable leather and have structure but not too stiff. (Their Bay Leather is much more supple and pliable). I chuck this thing into my backpack and purses all the time – and holds up really well. If you order, I highly recommend adding a pen loop. Best 5 bucks you’ll spend, I promise! For pens, I am LOVING that 4-color Pilot Hi-Tec coleto. I used to think it was that meh blue and white body but in that gold color it is stunning. Inside I have 0.4mm gel ink refills and it writes smooth like a dream. Dare I say it makes my bullet journal look neater? I also do some outlining with a Medium Faber Castell pen and adding color with Staedtler Fineliners and Tombow Dual Brush pens. These are the core four to my planning this month. YellowPaperHouse A5/large dot grid insert for planning. I strictly plan and reflect on my weeks in these. I don’t often need to reference far back in my plans, so 40 pages is just fine – it helps keep my planner light. It lasts me about 2 months with my current system. May Designs grid notebook for my daily log. Originally inspired by Dee’s use of the daily log, I started using it to quick jot notes about my day. I’ve been using her Daily Prompt Cycle as quick reflection points. I plan on using this as my gratitude and highlights notebook this month! Thanks Kim! Another May Designs grid notebook joins me this month as I get more serious about my blog and PrettyPrintsandPaper endeavors. Here’s where I track to do’s, threaded to longer collections to better plan for posts and other things. Last, I have a Moleskine large cahier notebook for my Collections. I recently did a run through of some of the lists inside here. Take a peek! Since these lists are MUCH more durable than my week-t0-week plans, I like that they are separate. Read more about my notebook comparisons here. I have NOT reviewed the LT1917 since they don’t fit easily into my dori covers, so these are the ones that do. Since I’m only halfway through my YellowPaperHouse insert, I decided to continue with my book despite the new year (I try to avoid wasting stuff when I can). Every Sunday, I take 20-30 minutes to set up the upcoming week by choosing a new set of colors and making tiny tweaks. As you have noticed, January 1 falls on a Friday, so that means I set up for the month on Sunday, December 27. I do NOT set up months ahead of time. For me, it’s nice to just have the flexibility of going forward differently, adapting to emergent needs. Something about January screams “blue!” to me, so I reached for my Tombows to add a lettering touch to the headers. Please know that lettering is my own hobby that I like to add into my pages – NOT a requirement to Bullet Journal. It’s just fun for me to add to my pages! Based on what worked last month, I’ll modify for this month. Last month my habit tracker wasn’t really used, so I think I need to move it back to weekly tracking, and only focus on a FEW key behaviors that will specifically support my personal goals. Based on that, I’ve come up with this for the month. As I think of things I have to do sometime this month, I’ll add it in. Errands I have to run, I’ll add it in using shortcuts like “R” for return or “Ex” for exchange. You’ll notice that grocery lists are NOT on here because that’s something Mr. PPP and I sync up on via the Grocery IQ app during our Sunday Meetings rather than on my own paper list. Quick detour on expense tracking: Because he’s a huge Excel nerd, Mr. PPP and I have a very intense budgeting tool we’ve created to identify our expenses and how to save for our many financial goals (vacations, gift-giving, house, etc). Based on this collaboration, I derive my personal discretionary spending number for the month. In the past, I’ve tried to stay under that number, period. However, it’s been more retroactive rather than proactive, so this month I’m trying to forecast expenses I KNOW I will have. For example, I’m visiting one of my friends for her bachelorette party, so I already know I’ll be spending money eating at the airport. I added a column to each of my personal spending categories and put a ballpark estimate on what I might spend, to better be intentional about my impulsive spending habits. As for my weeks I’ve learned that I am a weekly girl, through and through. I’ve been conditioned to see my weeks vertically, so that’s how I draw them in every Sunday. I pick colors on a whim, just to add visual intrigue that keeps me using the system. There aren’t many other decoration pieces, very few stickers especially as of late, so lettering is how I add aesthetic. I do minimal weather for the week all on Sunday night – the benefit is deliberately walking through the week’s crazy weather at once, just to get a sense of what’s coming. There have been many days where my outfit was completely off – and if you work at a college, what you wear matters when you walk across campus! If there’s a date-intensive task, I put it into the corresponding date. Everything else that I need to do that week, I put into the bottom left. I casually group work-related items on the left column, home-related items on the right. I am not bothered by the two existing in the same place! It provides harmony and it is all in one place. I acknowledge the events and meetings in my weekly, more so as a capture of how I’m spending my time rather than scheduling. Like the weather, it’s how I preview everything coming up. It helps me mentally enter the week and the prep work that comes with it. The bottom right becomes whatever I need it to be. The last few weeks it’s been keeping track of my grading, in the past it’s been an expense tracker, other times it’s been journaling – so this week it’s a weekly tracker and anything I think of that’s upcoming. TBH I haven’t used that much since it’s a light week, so I’ll try something different next week. For others, this might solve the “future planning” problem if you go week to week. So that’s the process! I’m excited to go through the #planwithmechallenge threads today and see how you set yours up. Anything I mentioned that you might try? Let me know down below! This post includes a couple affiliate links – which means if you happen to buy something, I get a small commission at no extra cost to you – these are products I do love and recommend! Thanks in advance for your support! I’m getting into BuJo and this is the method I was trying to cook up in my head with my may designs books – you have it all laid out perfectly! Question – I’m on the etsy shop for foxyfix but #1 I don’t know how to know if you get credit because the link you included went to their site but from there I went to etsy, and #2 i’m not sure which size or cover is needed for this method. help??? Oh I won’t get credit for the FoxyFix but that’s okay! She’s a great gal and their shop is going to be a great experience for you. I use a “Wide” which is what you might recognize from Moleskine Cahiers. I love this size, personally. But it differs from person to person – I just don’t think I’d be able to fit things in a field-notes size! Did you decide on a size in the meantime? Thanks for the input! I am using 3 May books right now and just want to be sure I have room! Will wide hold 3? I love your set up so much! I was just wondering about the pilot pen – I’ve always had trouble with gel pens, skipping when I write etc. Do these skip bits of ink or are they generally ok? Love your setup! Where did you get the monthly calendar stamp (and coordinating dotted lines stamp)?